Character = Who we are when no one is watching. Hopefully it’s good character! 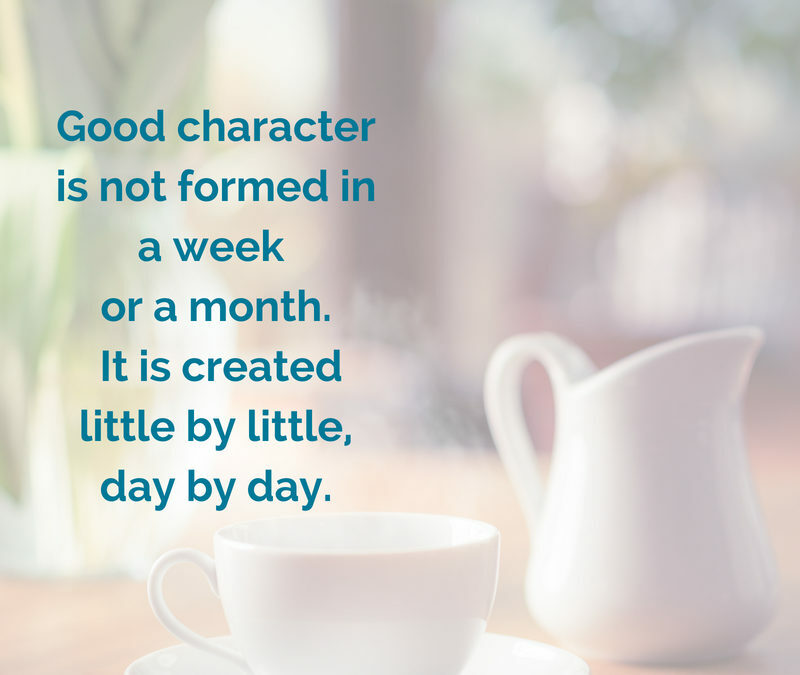 “Good character is not formed in a week or a month. Social and News media is filled with scathing reports detailing the faults of individuals in all walks of life. No person is born with all these character deficits. Negative character qualities develop one at a time, day by day, just like as good qualities. Do you relate? I’m sure you have a few character qualities you’d like people to overlook, just as I do… right? However, with this attitude, we might be adding to the problem, rather than improving it. Chicken or egg? Is this good character just supposed to show up…? If we are the only ones who can change ourselves, how much time and effort do we put into developing our own good character? And by acting and reacting, demonstrating a good character, how could we impact the world around us for good? Parents care about the character of their children – but where do children first see examples of how to be? From their parents and caregivers, of course. 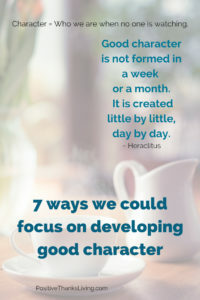 Perhaps it’s in our best interest to care about developing our own good character if we are invested in how the world around us behaves, rather than merely joining in on the criticism-fest. Easier said than done? Maybe. Maybe not! PEOPLE: surrounding ourselves with people who demonstrate good character – it’s said we are the sum of those we spend time with. READING: reading to develop our character – our brain needs sustenance, what are we feeding it? BOUNDARIES: setting boundaries in our life to manage areas where our character might be tempted or swayed. We are all susceptible. DECISIONS: making decisions with deliberate care and consideration, not on a whim or in the middle of intense emotion. HABITS: designing our habits to support our good character development. Habits. It’s the small things that make up the great things. GREATER THAN OURSELF: following a higher ideal. The belief and adherence to something greater than our self will make a difference even when we fail. 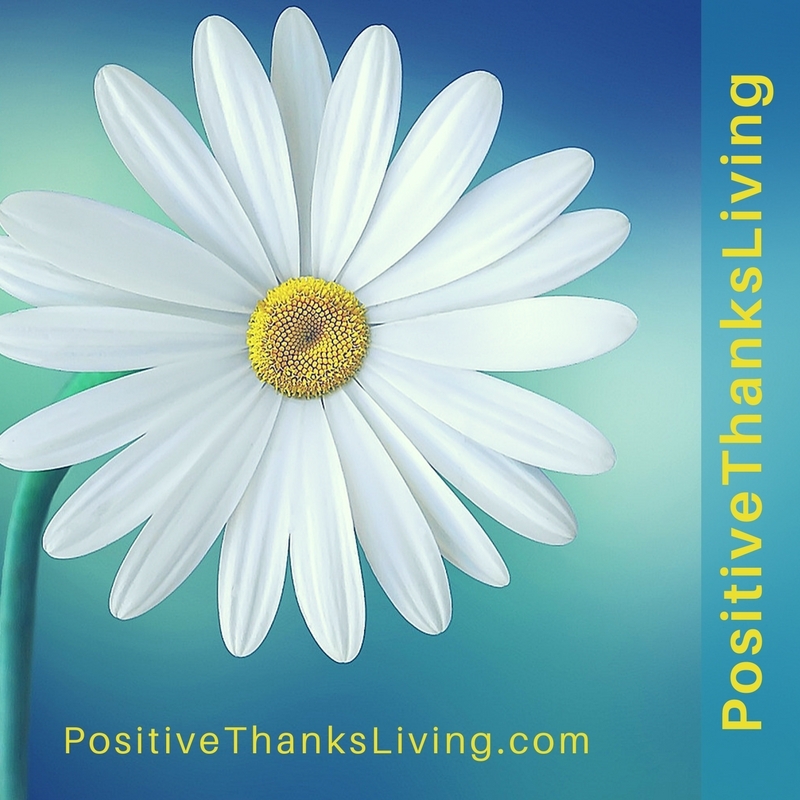 Rob and I are Christ followers and often speak of the Fruit of the Spirit (love, joy, peace, patience, kindness, goodness, faithfulness, gentleness, and self-control) as a barometer of our character. 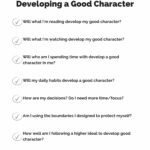 Resources to develop a good character. When we homeschooled our children we used “The Book of Virtues” by William J. Bennett. This book is a collection of stories and fables on virtues – character qualities. These moral stories provided the opportunity to ask questions and discuss ideas in areas like friendship, courage, honesty, compassion, and responsibility. Rob and I found some of the stories quite challenging and personally convicting. I’m looking forward to getting that book out of storage! Another book I’ve been researching is called “What Do You Stand For? For Teens: A Guide to Building Character”. It has a teen version and a child version, along with the option of a game. If you don’t have teens in your home right now, the lists and questionnaires would still be good exercises to go through as an adult. What we need to learn isn’t defined by age. 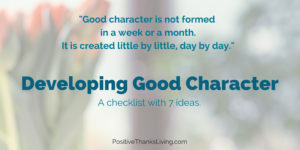 And finally, here’s a one-page checklist to download as a reminder to focus on your character – it’s the above 7 points as questions to ask yourself. 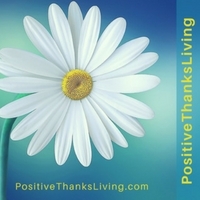 Post it on your bathroom mirror for a bit, and see if it sparks something positive. No email needed, click HERE to download. Have your children been introduced to character building resources in school? 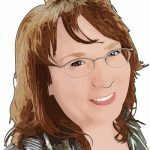 Perhaps you’re a teacher… do you have any recommendations? Please leave a comment!